Webber went into the final round all with a shot at the title in 2010. 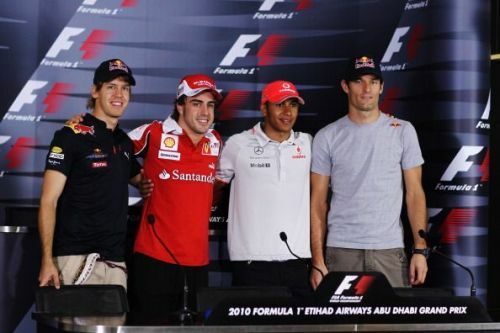 The 2010 F1 driver's championship was primarily fought between Fernando Alonso of Ferrari and Mark Webber of Red Bull and going into the final round in Abu Dhabi, Fernando held an 8 point advantage over Webber. Webber's team-mate, Sebastian Vettel had an outside shot of the title, being 14 points behind 'Nando before a wheel was turned in the UAE. Lewis Hamilton also had a slim chance of winning the title, sitting 24 points behind Alonso with 25 to play for, he had to win the race to have any chance. Vettel qualified on pole and held his advantage into the first corner, being followed by Hamilton and then Button, who'd got past Alonso into Turn 1. Michael Schumacher had a very short race, spinning and being collected by Vitantonio Liuzzi's Force India. Both retired and this brought out the Safety Car, causing some of the midfield runners to pit, something that would be crucial later on. Once racing had resumed, Webber, and then Alonso pit and both emerged behind the early stoppers, and in the era of 1-stop being the only viable strategy. Those that bided their time were rewarded with better track position, later on, Vettel and the two McLarens retaining their P1-3. Alonso was desperate to get past Vitaly Petrov into sixth, but even that wouldn't have been enough for the Spaniard to win the championship. He got desperate in the late stages, but the Renault was too fast in a straight line, and the Russian placed his car perfectly throughout. Seb crossed the line ahead of Lewis, overtaking the Brit as the youngest world champion in the sport's history, a record which still stands to this day. Nico Rosberg was a respectable P4, Robert Kubica led home a Renault 5-6 and Alonso finished a disappointing P7, not enough, and he likely as red with rage as his scarlet Ferrari.